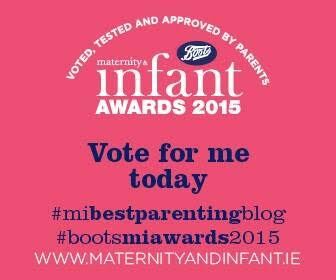 Maternity and Infant Awards – Best Parenting Blog Finalist. I actually cant believe I am writing these words, after a couple of months blogging – The Mamma Fairy blog has been nominated for an award and not just any award!! We are a finalist in the Maternity and Infant Awards under the category of Best Parenting Blog. This is the first year they have introduced this category for the awards and I am chuffed actually more than chuffed, im ecstatic to see my name listed next to bloggers I myself have admired and read throughout my pregnancies for support and guidance. I am really honored in my short blogging career to be considered in the same light as some my own favourite bloggers. The Maternity and Infant Awards are great in that they are based on real parent reviews and views, making them even more rewarding and prestigious for the winners. You can vote under three main categories, products, people and creche. Please do get your votes in to support your favourites under each of the above categories. There is also €1,000 to be won which would be an amazing prize! We are listed in the Product category under “For the Family – Best Parenting Blog”. I would truly love your vote if you enjoy reading the blog. I am looking forward already to the awards night where i will hopefully meet the nominees under the various categories of products I myself use and rely on, i do love putting faces to names!